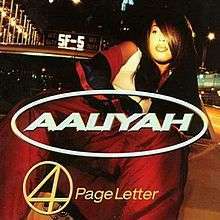 (1997) "Up Jumps da Boogie"
"4 Page Letter" is a contemporary R&B song recorded by American singer Aaliyah. The song was written by producer Tim "Timbaland" Mosley and Missy Elliott. Mosley produced the song and Elliott provided background vocals. It is the fourth single (third in North America) released from Aaliyah's second studio album, One in a Million (see 1997 in music). "4 Page Letter" received little airplay on mainstream pop radio, instead receiving more airplay on urban and rhythmic radio stations. It peaked at number fifty-nine on the Billboard Hot 100 Airplay chart and number twelve on the Billboard Hot R&B/Hip-Hop Airplay chart. CD & 12-inch singles were issued in the UK one featured the radio edit and 2 Timbaland produced remixes of "4 Page Letter" and the b-side. The other contained the radio edit backed with remixes of her previous single "One In A Million". Aaliyah performed "4 Page Letter", along with some other songs, at the 1997 Superfest concert on October 6, 1997 in San Diego, California. She also performed the song, along with others, at Summer Jam 1997, sponsored by New York City radio station Hot 97, on August 10, 1997. The B-side for the song was "Death of a Playa". The B-side features Aaliyah's brother, Rashad Haughton, and was produced by Timbaland. The song written by Aaliyah and Rashad. "Death of a Playa" would later be the B-side for the U.S. Double A-Side single release of "The One I Gave My Heart To" & "Hot Like Fire". The music video for "4 Page Letter" was directed by Daniel Pearl. The concept for it was created by Rashad Haughton. The video takes place in a forest and shows Aaliyah secretly watching a man dance and then later perform in a Native American village. The video moves to modern time where a group of people watch two men dance outside and then shifts back into the past where Aaliyah and the mysterious man dance in a large ring of fire.